BACKGROUND AND PURPOSE: To prospectively determine the sensitivity in the detection of multiple sclerosis (MS) lesions by using double inversion recovery (DIR), fluid-attenuated inversion recovery (FLAIR), and T2-weighted turbo spin-echo (T2 TSE) MR imaging at 3T. METHODS: Seventeen patients presenting with a clinically isolated syndrome (CIS) suggestive of MS, 9 patients with definite MS, and 6 healthy control subjects were included. Imaging was performed on a 3T MR system using DIR, FLAIR, and T2 TSE sequences. Lesions were counted and classified according to 5 anatomic regions: infratentorial, periventricular, deep white matter, juxtacortical, and mixed white matter-gray matter. The sensitivity at DIR was compared with the corresponding sensitivity at FLAIR and T2 TSE sequence. The contrast between lesions and normal-appearing gray matter, normal-appearing white matter, and CSF was determined for all sequences. RESULTS: Because of higher lesion-white matter contrast, the DIR showed a higher number of lesions compared with the FLAIR (7% gain, P = 0.04) and the T2 TSE (15% gain, P = 0.01). The higher sensitivity was also significant for the infratentorial region compared with the FLAIR (56% gain, P = 0.02) and the T2 TSE (44% gain, P = 0.02). Compared with the FLAIR, no significant changes of the lesion load measurements were observed in the supratentorial brain: slightly higher numbers of periventricular and mixed gray matter-white matter lesions on the DIR were counterbalanced by a slightly reduced sensitivity regarding juxtacortical lesions. CONCLUSION: DIR brain imaging at 3T provides the highest sensitivity in the detection of MS lesions especially in the infratentorial region. MR imaging in the diagnosis of MS is performed as a multisequence protocol including T2-weighted, fluid-attenuated inversion recovery (FLAIR) and precontrast and postcontrast T1-weighted sequences.14,15 The pulse sequences show different sensitivities in the detection of inflammatory brain lesions depending on their anatomic location. FLAIR imaging provides the highest sensitivity in the detection of lesions close to the CSF, such as the juxtacortical and the periventricular white matter, but is less sensitive in the posterior fossa.16-18 T2-weighted conventional spin-echo or turbo spin-echo (T2 TSE) sequences are known to be more sensitive in the detection of infratentorial lesions but have difficulties detecting juxtacortical lesions.13,16-18 Unfortunately, no pulse sequence is available that provides a combination of a high sensitivity for the detection of supratentorial and infratentorial brain lesions in MS patients. The aim of our study was to evaluate the diagnostic value of a DIR sequence at high-field MR imaging operating at 3T in the detection of MS lesions by prospectively comparing DIR with FLAIR and T2-weighted pulse sequences. Twenty-six patients were prospectively included in this intraindividual comparative study. Seventeen patients presented with a CIS suggestive of MS (median age, 40 years; range, 19–56 years; mean disease duration, 5 months; range, 0–8 month; median Expanded Disability Status Scale [EDSS], 1; range, 0–4). Nine patients had a relapsing-remitting course of multiple sclerosis (median age, 36 years; range, 23–47 years; mean disease duration, 51 months; range, 3–189 months; median EDSS, 1.5; range, 0–6). 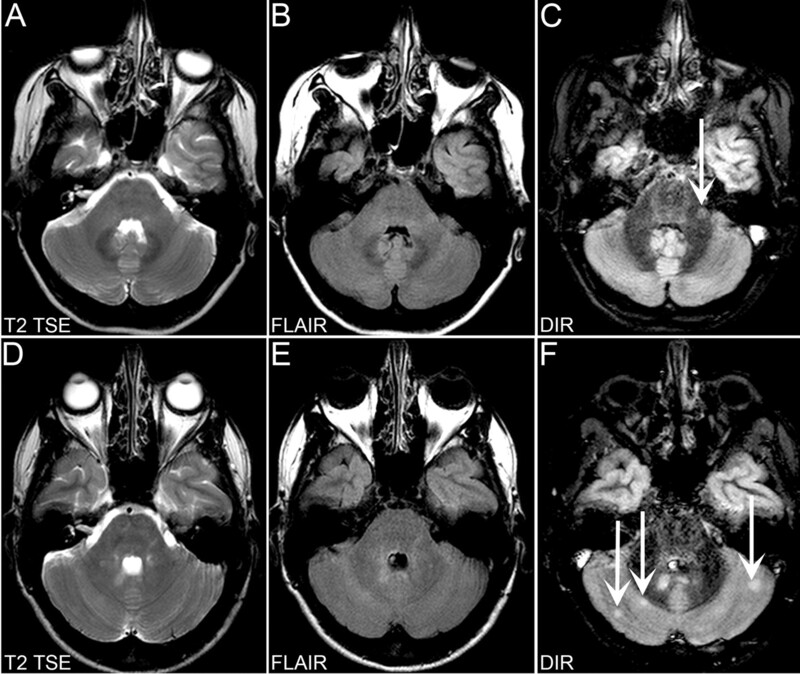 Among the patients presenting with CIS, 10 patients presented with unilateral optic neuritis, 3 patients with spinal cord syndromes, 3 patients with brain stem syndromes, and one patient with a polysymptomatic CIS. In addition, 6 healthy control subjects (3 men, 3 women; median age, 28 years) were included. All patients were selected and referred by the MS outpatient center, Department of Neurology, University Hospital Bonn. Our local ethics review board approved the study protocol. All patients gave written informed consent before the examination. Regarding the patients presenting with CIS the neurologic work-up included the CSF parameters (including the assessment of cellularity, protein level, intrathecal IgG synthesis, and oligoclonal bands by isoelectric focusing) and visual evoked potentials. All other differential diagnosis of CIS and MS including vascular, malignant, infectious, and other immunological CNS diseases were excluded by appropriate tests. Two radiologists interpreted the images by consensus after the images were transferred to a workstation (Easy Vision; Philips Medical Systems). The images of the different pulse sequences were separated and presented in a randomized order. Both readers were blinded to the clinical presentation and the results of the paraclinical tests. High-signal-intensity brain lesions with a size of >3 mm were counted and classified according to their location as infratentorial, periventricular white matter, juxtacortical white matter, mixed white matter-gray matter, or deep white matter lesions. All DIR, FLAIR, and T2 TSE images of the healthy control subject and patients were evaluated for artifacts. The contrast ratios of all 3 pulse sequences were determined from the respective mean values of the contrast between lesions and normal-appearing gray matter (NAGM), lesions, and normal-appearing white matter (NAWM) as well as between lesions and CSF. The contrast was defined as |SI1 − SI2|/(SI1 + SI2). SI1 was defined as the signal intensity of the lesions and SI2 as the signal intensity of the NAWM, NAGM, or CSF, respectively. The signal intensity measurements were obtained using the region-of-interest analysis. The regions were placed in the lesions, the NAWM, NAGM, and CSF. The contrast measurements between lesions and the NAWM were performed separately in the infratentorial, periventricular, juxtacortical, and deep white matter regions. Signal-to-noise ratio (SNR) and contrast-to-noise ratio (CNR) could not be calculated because of the automatic implementation of the constant level appearance (CLEAR) algorithm for signal intensity homogeneity correction of the images obtained by the 8-element SENSE head coil. The analysis of brain lesions on the different pulse sequences was performed lesion- and patient-wise. The statistical differences in both analyses were assessed using the Wilcoxon test for matched pairs. The relative comparison of the numbers of lesions on DIR versus FLAIR and T2 TSE, respectively, was expressed as percentage gain or a loss in the number of detected brain lesions. The significances of contrast differences between the 3 sequences were assessed using the Wilcoxon test for matched pairs. All calculations were performed by the SPSS software package (SPSS, Chicago, Ill). P values ≤0.05 were considered as statistically significant. Besides discrete high-signal-intensity changes caused by CSF effusion effects in the periventricular white matter and in the periaqueductal area, no unspecific white matter or gray matter abnormalities were identified on the T2 TSE, FLAIR, and DIR images. The DIR images showed slightly more artifacts in the posterior fossa in terms of vascular and flow artifacts than the corresponding FLAIR and T2 TSE images. Both readers found that those artifacts did not impair the diagnostic quality compared with the FLAIR and T2 TSE images. The attenuation of the CSF was sufficient and similar on the FLAIR and DIR images. The detailed results of the lesion load analysis are given in Table 2. In our patients with suspected or definite MS, 201 lesions could be identified with T2 TSE, 216 lesions with FLAIR, and 232 lesions with DIR. This higher overall detection rate at DIR was significant compared with both T2 TSE (P = 0.01) and FLAIR (P = 0.04) MR imaging. Considering the different anatomic regions, the higher detection rate of the DIR imaging was significant for the detection of infratentorial lesions compared with the T2 TSE (P = 0.02) and FLAIR (P = 0.02) sequence (Fig 1). The DIR detected 56% more infratentorial lesions compared with the FLAIR and 44% compared with the T2 TSE sequence. Regarding the supratentorial brain, higher detection rates were observed using DIR imaging compared with the T2 TSE imaging. This was statistically significant for the periventricular white matter (P = 0.03). The relative gain of detected lesions when using DIR imaging compared with T2 TSE imaging was 66% regarding the periventricular region, 10% regarding the juxtacortical region, and 50% regarding the mixed white matter-gray matter region. Compared with FLAIR imaging, DIR imaging showed a similar sensitivity in the detection of supratentorial MS lesions (Fig 2). FLAIR imaging depicted slightly more lesions in the juxtacortical white matter (relative gain of 6%) and deep white matter (relative gain of 3%), whereas DIR imaging identified slightly more lesions in the mixed white matter-gray matter (relative gain of 17%) and periventricular white matter (relative gain of 5%). None of these minor differences in the lesion load measurement reached statistical significance in the patient-wise analysis. 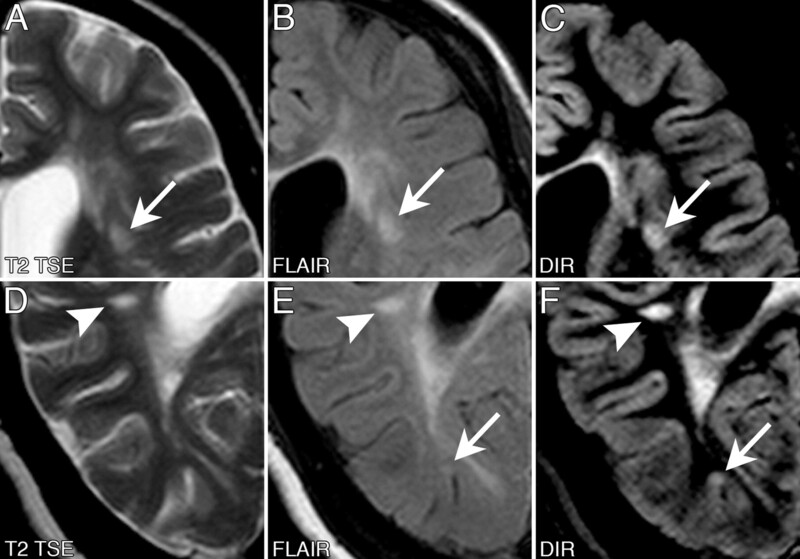 Figure 3 gives examples of the higher detection rate of mixed white matter-gray matter lesions on the DIR images. Transverse T2-weighted TSE, FLAIR, and DIR image examples documenting the higher sensitivity of DIR in the detection of inflammatory brain lesion in the infratentorial brain. Top row (A–C), A 36-year-old woman presenting with a polysymptomatic CIS. A sharp delineated inflammatory lesion in the left pedunculus cerebelli (arrow) can be clearly identified on the DIR image but not on the corresponding sections of the T2 TSE and FLAIR sequences. Bottom row (D–F), A 23-year-old man presenting with optic neuritis of the left eye. Compared with the T2 TSE and FLAIR images, more lesions in both hemispheres of the cerebellum (arrows) can be identified on the DIR image. Moreover, those lesions identified on all 3 sequences were better delineated on DIR compared with the corresponding T2 TSE and FLAIR images. Transverse FLAIR (bottom row) and DIR (top row) sections of the supratentorial brain. The inflammatory lesions have a more sharp delineated appearance on the DIR compared with the corresponding FLAIR images. Despite a minor contrast between lesions and the normal-appearing gray matter, DIR showed a high sensitivity in the detection of juxtacortical and mixed white matter-gray matter lesions (arrows). A differentiation between juxtacortical and mixed white matter-gray matter lesions is much easier on the DIR than on the FLAIR images. Regarding the periventricular white matter, the lesions are easier to identify on the DIR compared with the FLAIR images (open arrows). Image examples of the improved detection of mixed white matter-gray matter lesions on the DIR pulse sequence. 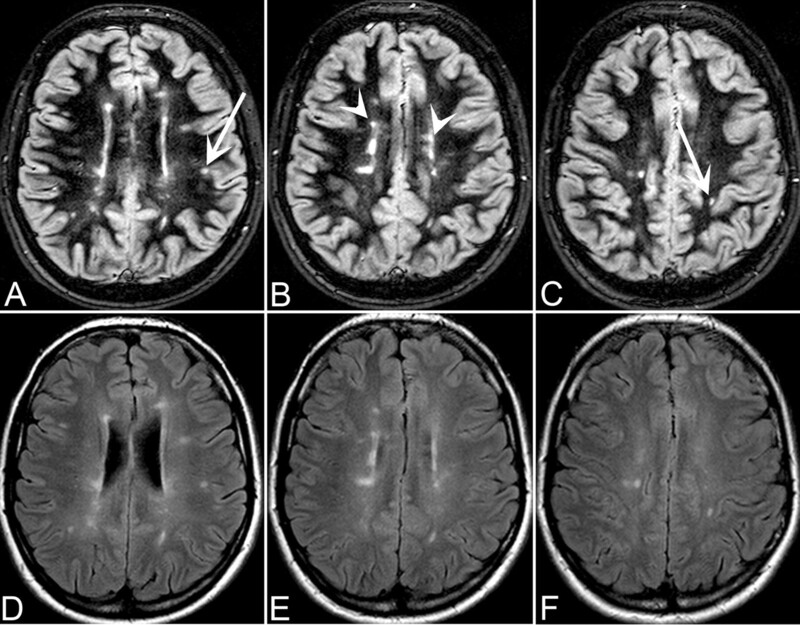 These images were obtained from a 40-year-old woman with a relapsing-remitting course of MS (disease duration, 165 months; EDSS, 6) presenting with a high lesion load on the MR imaging, including mixed white matter-gray matter lesions. Top row, an example of different classifications of a lesion using different pulse sequences. A lesion (arrow) was prospectively classified as a juxtacortical lesion on the T2 TSE and FLAIR images. Because of the better delineation of the white and gray matter on the DIR image, this lesion had to reclassified into a mixed white matter-gray matter lesion. Bottom row, an example of the higher conspicuity of a cortical lesion (arrow) on the DIR image that was not prospectively identified on the corresponding T2 TSE and FLAIR images. Another lesion (open arrow) could be easily identified and categorized on the DIR image as a pure juxtacortical lesion without touching the cortex. The areas of the region of interest had a mean size of 65 mm2 (SD, 23 mm2; range, 34–107 mm2) for the NAGM, 100 mm2 (SD, 37 mm2; range, 48–178 mm2) for the CSF, 101 mm2 (SD, 37 mm2; range, 36–161 mm2) for the NAWM, and 74 mm2 (SD, 39 mm2; range, 24–190 mm2) for the lesions. The results of the contrast measurements of DIR, FLAIR, and T2 TSE imaging are listed in Table 3. The contrast between lesions and the NAWM was higher on the DIR images compared with the corresponding T2 TSE and FLAIR sequences in every anatomic region (DIR compared with the T2 TSE and FLAIR sequences regarding the juxtacortical, periventricular, and deep white matter region, P = 0.05; DIR compared with the T2 TSE and FLAIR sequences regarding the infratentorial brain, P = 0.03). The contrast between the lesion and the CSF was also superior using DIR imaging compared with T2 TSE and FLAIR imaging (P = 0.05 compared with both T2 TSE and FLAIR imaging). Regarding the contrast between lesions and the NAGM, FLAIR, and T2 TSE imaging showed slightly higher contrast values that did not reach statistical significance (FLAIR compared with DIR, P = 0.72; T2 TSE compared with DIR, P = 0.29). The experiences of DIR brain imaging in the past are limited to magnetic field strengths up to 1.5T. Higher magnetic field strengths are providing an almost linear increase of the signal-to-noise ratio, and they enable us to invest these higher signal intensity values in faster imaging techniques, including parallel imaging protocols.24,25 In addition, high-field MR imaging in patients with MS provides a significantly higher sensitivity in the detection of inflammatory brain lesions compared with lower magnetic field strengths up to 1.5T, leading to diagnostic relevance in terms of diagnostic imaging criteria.26-28 Therefore, 3T MR imaging is a promising method to achieve DIR imaging with an acceptable acquisition time in combination with a high sensitivity in the detection of MS lesions. Although artifacts in the posterior fossa, such as vascular and flow artifacts, were slightly pronounced on DIR imaging, the higher sensitivity in the detection of infratentorial lesions was not influenced by a possible misinterpretation of artifacts for lesions. Because infratentorial lesions could not be identified on DIR imaging in the healthy control subjects, a misinterpretation of artifacts for infratentorial lesions is even more implausible, though those healthy control subjects were not exactly age-matched to both patient groups. High-field MR imaging at 3T allows the establishment of a fast and accurate DIR imaging protocol. In patients with suspected or definite MS, DIR brain imaging at 3T provides the highest overall sensitivity in the detection of MS lesions compared with the standard pulse sequences of FLAIR and T2-weighted TSE. This higher sensitivity is especially obvious in the infratentorial region and is therefore of major prognostic relevance. We thank Hanno Schimikowski for the help establishing the figures and Renate Blömer for the technical assistance. We also thank Jeroen J. G. Geurts, PhD, for providing his expertise in gray matter pathology and DIR imaging in multiple sclerosis. This work was presented on the 4th International Symposium on Highfield MRI in Clinical Applications; September 9–10, 2005; Bonn, Germany. Wattjes MP, Harzheim M, Kuhl CK, et al. Does high-field MRI have an influence on the classification of patients with clinically isolated syndromes according to current diagnostic magnetic resonance imaging criteria for multiple sclerosis? AJNR Am J Neuroradiol 2006;27:1794–98. Accepted after revision March 8, 2006. How Common Is Signal-Intensity Increase in Optic Nerve Segments on 3D Double Inversion Recovery Sequences in Visually Asymptomatic Patients with Multiple Sclerosis?